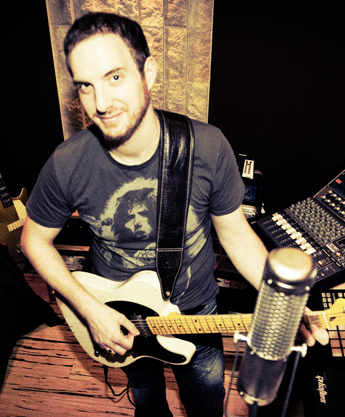 Guitarist since the age of 13, François-Maxime Boutault started his musical journey by playing in several local bands in High School. While passing his Electronics Degree, he discovered his first real recording studio in 2001 by assisting AL.SO founder Olivier Bolling @ Studios PLUSXXX for the first Neve 88R installation. During his Sound Production studies, François-Maxime learnt his craft again at Studio PLUSXXX and Studios Davout in Paris, where he worked with artists like Subway & UK producer Teo Miller, Daran, OFX and Jean-Louis Murat. He then became FOH engineer for famous french metal band Dagoba during their european tour, leading him to support international acts such as Korn, Machine Head, Fear Factory and Deftones and work with international bands like Kill2This and Slitheryn. After receiving a Master's Degree in Sound Production, he helped running french recording facility Studio de la Reine in Paris and then worked as permanent engineer for 4 years. This is where he had the opportunity to record and mix for artists such as Julien Doré, Jasmine Roy & Philippe Saisse, jazzman Sébastien Charlier w/ Curt Bisquera & Alain Caron, as well as Black Bomb A w/ the Exploited, Patrick Wolf, french punk act Berurier Noir or french pop artist Aldebert... and clients such as Sony, Universal, Wagram, Because Music, etc. Today François-Maxime Boutault is offering his various skills and work ethics through Les Liens du Son, by working for major and independant artists, "no matter what the genre is".